The school year has begun and with it the race to launch after-school coding clubs across the country. Girls Who Code, a visionary leader in the learn-to-code movement, is undergoing a five-fold expansion to 500 clubs this year. So how do you roll out 500 clubs, nationwide, all at once? Well, you start by entrusting the coding platform and curriculum to a partner. Codesters is proud to be GWC’s platform and curriculum partner to help propel this extraordinary and worthwhile initiative. Girls Who Code can now spend their time and resources signing up amazing volunteers and getting girls excited about coding. As for the Python lessons, we’ve got that covered. That’s what we do. We focus on building engaging, dynamic coding curriculum so that kids become fluent in this critical literacy. And so that kids can build stuff of course! Our platform includes a creative toolkit of code for graphics, animation, and interactivity that will empower these girls to create engaging projects and share them with their friends. And on the back end, our built-in learning management system enables GWC to flexibly enroll students into clubs, distribute coding lessons on the platform, and monitor their progress. All the features currently available to the schools on Codesters are now helping Girls Who Code’s unprecedented movement to teach thousands of girls how to code. We couldn’t be more thrilled for the opportunity. Chancellor Fariña believes that a key to success is “bringing together our public and private sectors to create more STEM programs available to students of all ages” and mentions three programs supported by AT&T that partner with DOE: the Software Engineering Pilot (“SEP”), Girls Who Code, and Pathfinders. We wholeheartedly agree and are proud to partner with all three of these excellent programs. Codesters hosts interns from Pathfinders and provides our platform and coding curriculum to SEP schools and to Girls Who Code clubs across the US. Chancellor Fariña is joined by other city leaders, prominent institutions, and corporations in the work to expand coding in schools. The ​New York City Foundation for Computer Science (“CSNYC”), started by venture capitalist Fred Wilson, funds programs such as SEP and district schools such as the Academy for Software ​for Software Engineering (“AFSE”). CSNYC has already helped bring coding education to 100 schools as part of its mission to “to ensure that all of New York City’s 1.1 million public school students have access to a high-quality computer science education”. Microsoft, together with CSNYC, support the TEALS program that brings volunteer software engineers into city public high schools to teach coding. Google has launched CSFirst, creating new after-school coding clubs across the city. And under the leadership of Senior Director of K-12 education, Diane Levitt, the city’s investment in Cornell Tech is already producing tangible outcomes in growing coding programs in the city’s public schools. ​Working directly with, and listening to, local communities in neighborhoods across the city will be key to the success of these efforts. In Brooklyn, ​Borough​ President Eric Adams is collaborating with CEC members, community leaders, principals, ​teachers, and parents​ on a campaign to make Brooklyn the first of the boroughs to offer coding in every school, which an emphasis on helping schools with less economically less advantaged communities.​ Adams sees that a critical success factor to these efforts to expand coding in schools will be the input, buy-in, and support of all New Yorkers. ​What all these leaders recognize is​ that getting coding into schools is a ​means to ​ensuring that all students have access to opportunities in our future economy. Fariña’s statements and these various city and local initiatives are signs that New York City​ is arriving at the critical moment when we rise to the challenge of getting coding into schools. The Codesters team is excited to be part of the movement and I am personally inspired by the leadership I am witnessing. 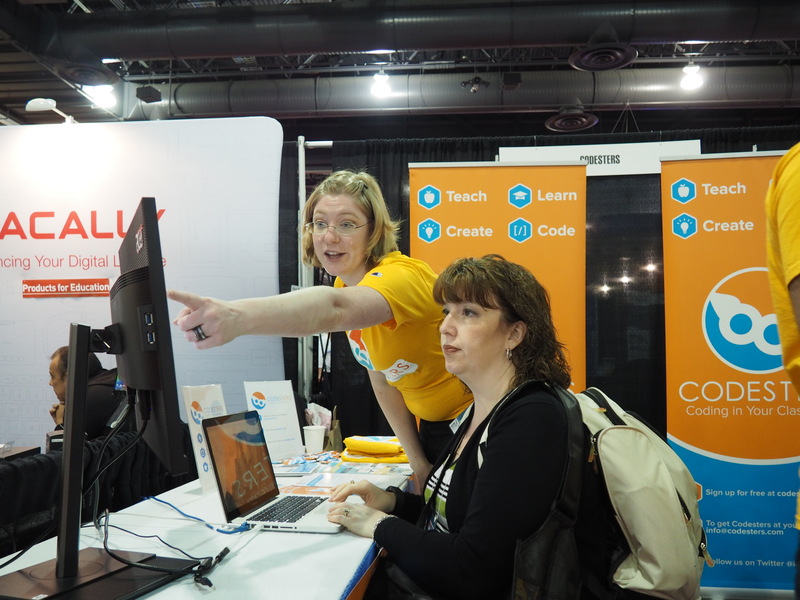 Codesters just returned from our first ISTE conference. Twenty hours of exhibiting is exhausting, but it is also inspiring. Teachers, school librarians, school and district technology coordinators, principals, technology trainers, and district representatives are actively working to bring programming into classrooms across the globe. Seeing attendee after attendee get so excited for our platform and curriculum crystallized for me what makes us different. Meg Ray, of the Codesters Team, demonstrating how our platform works. A teacher from a school in California for students who are at risk of dropping out was happy that we teach Python, a professional programming language. He explained to me that he wants to use Codesters because his students need to go beyond block-based languages so that they have more opportunities open to them in life. A teacher from Virginia, told me that the district wants all of her 6th graders to start learning code. She wants to use Codesters because she found four ways that the drag-and-drop toolkit will allow her to differentiate in her mixed-ability classroom, just during our short demo. students, and we are busy gearing up for a school year full of code.